Enhance your partnership with your customers through a real-time collaboration portal. Access to Schedule Details, Change Orders, Log and Track Issues in the cloud. Project owners want more information. This is how you give it to them. Share in real-time to build trust and promote project owner buy-in. All part of ADEACA Project Business Automation™ (PBA). ADEACA PBA™ Project Owner Collaboration is built on Microsoft Dynamics 365 for Finance and Operations, giving you an enterprise ERP tailored for project-based companies out of the box. Project Business Automation unifies all project business functions, ensuring that all stakeholders are always aligned. The Project Owner Collaboration portal extends this alignment to the end customer, providing real-time insight, communication and collaboration fully in sync with the operational plan. 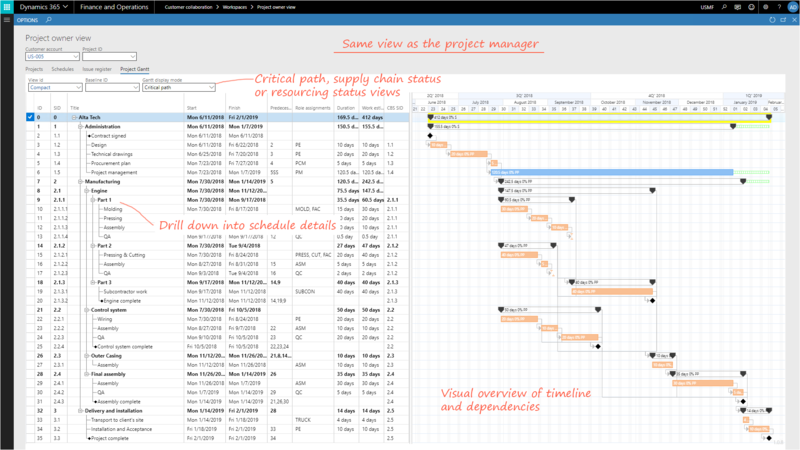 As a project business, what if you could provide your customers with real-time visibility into the status of their projects? Would you win more deals? Could you build trust with your customers and create better working relationships? That is the aim of Project Business Automation. By transforming how project businesses run, we can vastly improve the project owner experience and significantly increase the likelihood of project success. Quickly see how the project is progressing. Easily note schedule conflicts and dependency issues. ADEACA PBA's Sensor Points™ are used across financial and operational disciplines to automatically monitor project events, flagging deviations and trends. Get a real-time in-depth overview of project health based on these unique signals. Dive into schedule milestones, delays and conflicts to uncover potential issues before they become big problems. Every project has changes. Streamline the process and keep an audit trail of change orders tied to specific areas of your project. Project Owners can create change orders, upload supporting documentation, and request an estimate for the change. No more budget surprises at the end of the project. Everyone is always aware of the proposed costs of keeping things on track. Avoid surprises and raise issues before they become major problems. Generate awareness of issues instantly and solicit help from the appropriate stakeholder instantly. No matter what specific industry you serve, the project-owner portal can be configured to meet the needs of your customers. Amaze them with your willingness and ability to provide the information they need at the tips of their fingers.